Pricing Strategy Analysis for Excel (Billing Model) is designed to test changes in billing structures for any professional practice and can be used to test the impact of fee and pricing changes based on product mixes and sales volumes. When billing structures are altered they impact on customer numbers and in turn revenue and profit. This Billing Model allows you to forecast what this impact will be. It does this using a percentage change in customer or sales numbers. This is the percentage change in customer numbers when your billing structure is changed. For each business, this is influenced by the level of competition, differentiation of the business, client profiles, and type of service provided. An estimate of this percentage combined with basic data on average billing fees and cost percentages allow revenue, profit and customer numbers to be forecast for the range of billing fee combinations. Pricing Strategy Analysis for Excel considers two billing structures, Current (1st) and Proposed (2nd). From basic billing and cost data breakeven points at revenue and profit will be calculated for the proposed billing structure. Breakeven points tell you the percentage change in customer numbers at which your current and proposed billing structures provide the same Revenue or Profit. If you change billing structures and the percentage change in customer numbers is greater than the Revenue Breakeven your Revenue will decrease, if it is greater than the Profit Breakeven your Profit will decrease. You can input an estimated percentage change in customer numbers to forecast the Revenue, Profit and Customer Numbers for your business for the full range of current and proposed billing structure combinations. 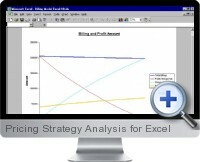 Pricing Strategy Analysis for Excel results are displayed in easy to interpret Charts and Table format. Details displayed include Revenue, Profit, and Customer Numbers.